We are a local Charlotte firm and have vast experience in the Carolinas and beyond. It is our mission to provide outstanding accuracy, dependability, timeliness, and professionalism in every single job we take. Give us a try today! 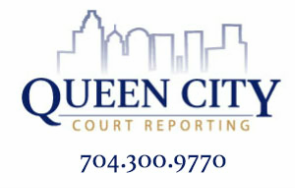 Shannon loves her court reporting career and has enjoyed working with clients both in New York and North Carolina. She worked for Adams and Holt for seven years and specializes in construction and medical malpractice. She provides services in court hearings and trials, zoning and board meetings, as well as depositions in all areas of litigation. Having a pre-reporting background in military, not-for-profit, small business and corporate fields has given her a well-rounded familiarity with the terminology of various professions. Personable, professional, and with a high level of integrity, Shannon will go out of her way to ensure you achieve your deposition goals. In her free time, she enjoys running, traveling and spending time with her husband and two children. Emily has enjoyed a successful career in the court reporting arena for more than 12 years. She has always practiced in the Carolinas and for that reason has a vast knowledge of litigation in this region. Emily was fortunate to work closely with Romelia Adams and Diann Holt of Adams and Holt, Inc. for most of her career. Prior to that she was with Charlotte Court Reporting. Emily is customer service oriented and comes to each deposition with a can-do attitude and enthusiasm to help her clients achieve their goals and have a pleasant, professional experience each and every time. She received her Bachelor's of Arts degree in English from St. Andrew's University in Laurinburg, North Carolina. In her time off, Emily enjoys riding and showing her hunter-jumper thoroughbred Rock Music, as well as teaching English as a Second Language to people from other cultures.